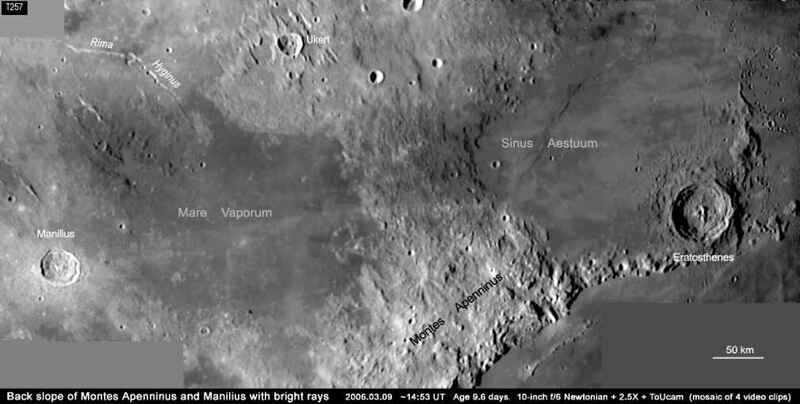 One arm of Manilius rays stretches across Mare Vaporum and the back slope of Montes Apenninus. The ray is as long as 450 km, almost penetrating into Sinus Aestuum. It is lengthy because (1) the impact energy to create Manilius is truly huge; (2) the Moon's surface gravity is only 1/6 that of Earth and (3) the Moon has no air to retard the ejected materials during the crater-forming impact. In more massive impacts such as Tycho, the bright rays stretch even longer, up to 1800 km ! Note also the regions of DMD (dark mantle deposit, Map 9) in the immediate north of Rima Hyginus and in the eastern edge of Sinus Aestuum. 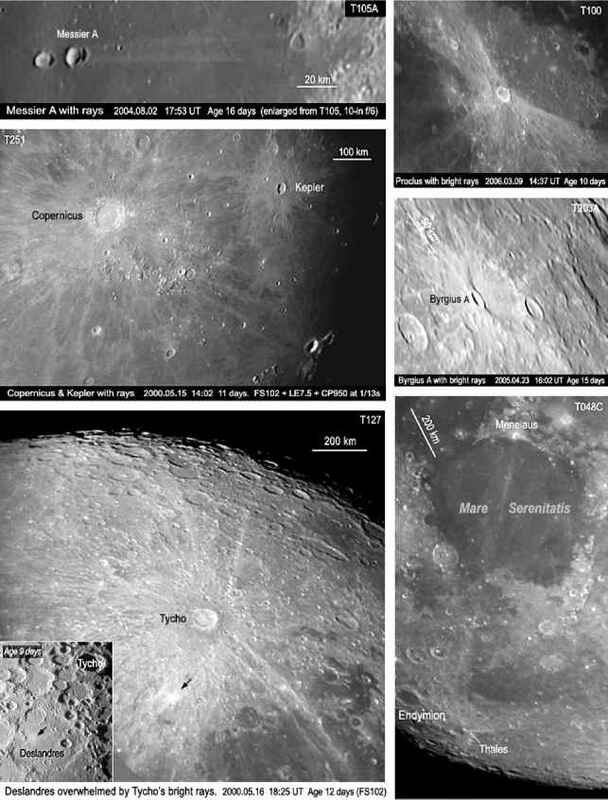 Libration allows the nearside of the Moon to be seen from slightly different angles at different time, producing an overall view of the lunar surface that adds up, over time, to 59% of the total. It was first noted by the Polish astronomer Johannes Hevelius (1611-1687). There are three types of optical librations. 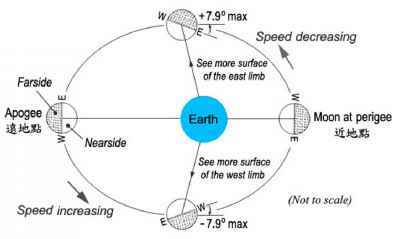 Libration In Longitude is due to the fact that the Moon moves faster when it is near perigee and slower when near apogee, but its rotation remains constant. This means that the Moon's rotation is not yet in perfect synchronization with its orbital motion. As a result, the Moon appears to wobble back and forth around its rotation axis. The additional longitudinal surface that can be seen with this libration is ±7.90. ** Due to irregularities of gravitational pull by the Earth and the Sun, the Moon does librate very slightly by itself; this is known as physical libration. See Appendix - Moon Data. Libration In Latitude is due to the tilt angle of the Moon's equator (or rotation axis) from its orbital plane. As a result, the Moon appears to nod its polar regions towards and away from the Earth as it goes around its orbit. The additional latitudinal surface that can be seen with this libration is ± 6.80. 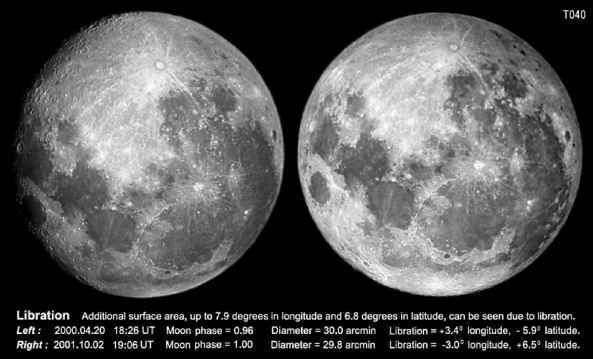 Diurnal Libration (MB^^i) gives an extra 10 of visible surface round the east or west limb of the Moon, because the Earth's rotation brings a terrestrial observer at slightly different view angles between moonrise and moonset. Simultaneous observations of the Moon disc from two cities on Earth also produces a parallax, such as 0 shown below. Libration in longitude and libration in latitude occur concurrently and repeat every 27 ~ 28 days (approximately one sidereal month). They are quantified by parameters l and b, i.e. 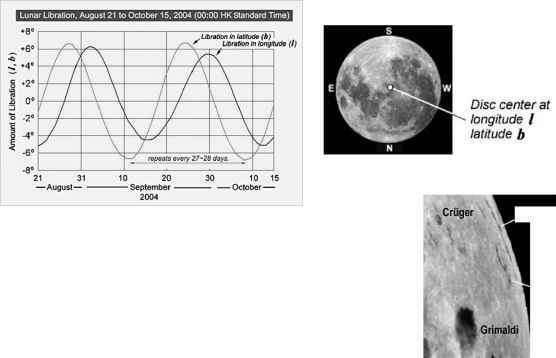 the shift of zero coordinates (00 longitude and 00 latitude) from the Moon disc's exact center at that moment. They also mean that the disc center is now at longitude l and latitude b. A positive value of l or b gives more surface of the east or north limb exposed to Earth. A negative value of l or b gives more exposed surface of the west or south limb. 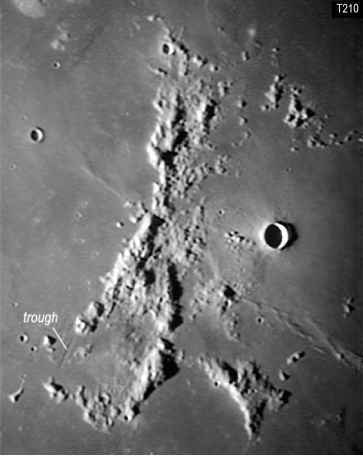 Lunar libration causes surface features near the limb distort noticeably in angular dimensions, and features very close to the limb may be temporarily out of sight. For instance, Lacus Autumni (Autumn Lake) and Lacus Veris (Spring Lake) appear on the west limb only at very favorable libration. The visibility of the maria on the east limb (T056D, next page) are also libration dependent.